Grand Rapids, MI – A new study published in the Journal of Conservation Biology reports the combined conclusions of a panel of U.S. and Canadian fisheries experts that bighead and silver carp would have little negative effect on Lake Erie perch and walleye populations if they got into Lake Erie and became established. 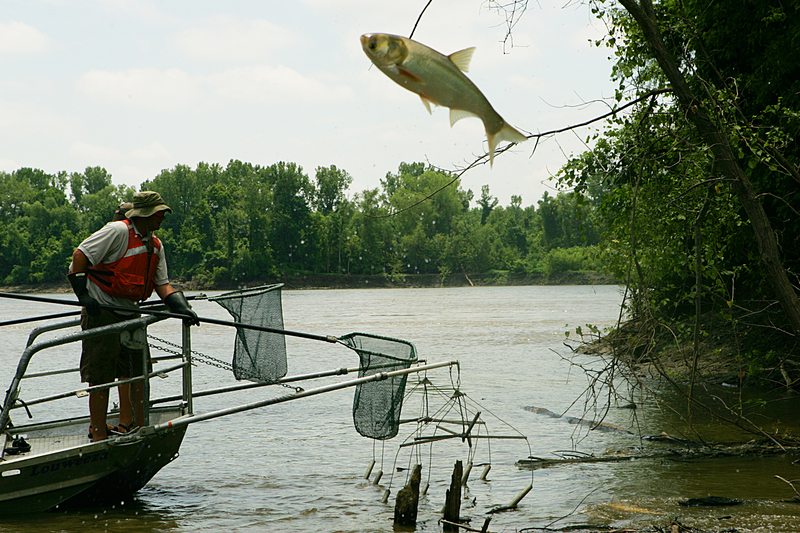 The study authors say it is also possible that the presence of Asian carp could boost perch and walleye populations. “One reason yellow perch populations might increase is they might use the bighead and silver carp as a food resource when they (the carp) are still small,” reports Marion Wittmann, the study’s lead author and post-doctoral researcher at the University of Notre Dame “Some experts say they would eat the carp eggs and fry. The National Oceanic and Atmospheric Administration and Great Lakes Restoration Initiative-funded study aggregated the opinions of 11 scientists, all fisheries or aquatic ecology experts. They are affiliated with institutions like the U.S. Geological Survey, Purdue University, Ontario Ministry of Natural Resources, University of Guelph, University of Toronto and Committee of Advisors for the Great Lakes Fishery Commission, among others. What they predicted is a range of possibility. Their combined opinions challenged the popular idea that the filter feeding carp would cause sport fish populations to decline by consuming the plankton and phytoplankton that young walleyes and perch species need to thrive. “That (scenario) might not happen because bighead and silver carp eat different particle sizes (than perch and walleye) and the needed overlap in time and space may not be there,” Wittmann said. Lake Erie was chosen for the inquiry because it is the most likely of the Great Lakes to support invasive carp species, according to Wittmann. Its waters are warm and “productive,” meaning it has plenty of algae and plant life to eat. Asian carp have also been found there in the past. David Lodge, the director of the University of Notre Dame’s Environmental Change Initiative and study co-author said the inquiry tapped the knowledge of leading experts on Asian carp about the effects in the Lake Erie basin, but doesn’t attempt to quantify any effects in the tributaries that feed the lake. Asian carp likely would spawn in rivers, according to Wittmann. They have disrupted river fisheries in other parts of the country. The study assessed only the possible changes to fish biomass in Lake Erie, taking into account any changes that might occur with perch, walleyes, gizzard shad and rainbow smelt. Only “minor effects” were found for each. A wide range of possible effects was predicted for walleyes and perch. The panel’s findings were that bighead and silver carp biomass would range from zero to more than 25 metric tons, which is more than the combined weight of all the perch and walleye in the lake. They estimated that yellow perch biomass would not go down, and that it could increase by 15 percent to as much as 50 percent. Walleye biomass likely would decrease by 10 percent, perhaps even 40 percent, but could increase by more than 60 percent. Wittmann said the findings may be applicable to other of the Great Lakes where there are similar fish communities. This entry was posted in Uncategorized and tagged Asian Carp, Conservation, Environment, Fishing, GLRI, Lake Erie, NOAA, University of Notre Dame. Bookmark the permalink. I’m not buying it. Let’s just remove all doubt and keep them out.